Short for "linear binning", linbin is an R package for manipulating, binning, and plotting linearly referenced data. Although developed for data collected on river networks, it can be used with any interval or point data referenced to a 1-dimensional coordinate system. Flexible bin generation and batch processing makes it easy to compute and visualize variables at multiple scales, useful for identifying patterns within and between variables and investigating the influence of scale of observation on data interpretation. Fixes a bug that caused results from sample_events() to be returned out of order in certain cases when by = was used in a sampling function. Functions from core packages are now called explicitly, i.e. package::function(), with the exception of graphics functions which are all imported to the namespace. 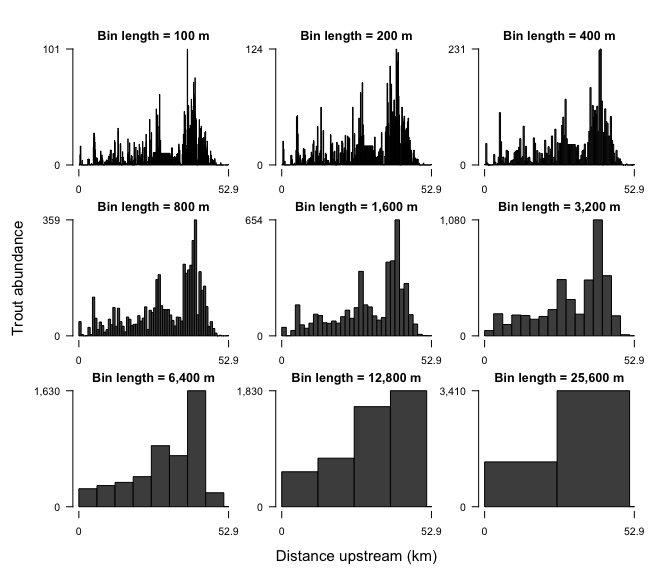 Package citation and documentation points to the journal article Multiscale analysis of river networks using the R package linbin. The linbin R package is released into the world! Further changes will be tracked here.